Lincoln Road, Miami Beach's iconic retail strip has seen its ups and downs over the years. With a new master plan and Business Improvement District designation, the City and local businesses and property owners are investing in another upswing. 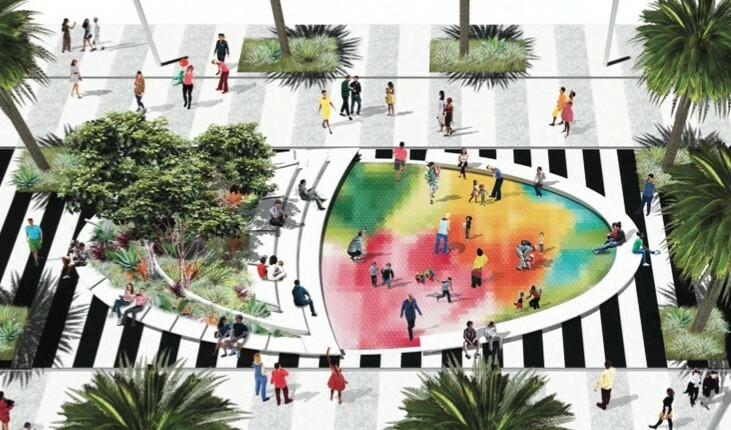 The master plan includes larger sidewalks, new landscaping, and turning alleyways into pedestrian walkways to expand retail and restaurant opportunities, as well as better integrating sidewalk cafes into the pedestrian and shopping areas. It is designed by James Corner Field Operations, the New York landscape architects responsible for the High Line in New York City and the new Underline in Miami. With the BID designation, businesses and property owners within the district pay assessments that go into a fund to manage and market the area. It was approved last summer for a ten-year period. The City budgeted $22 million to fund improvements to Lincoln Road, however, once designs were completed, the actual cost was determined to be $43 million leaving a shortfall of $21 million. At a recent meeting, Commissioners indicated their support for continuing with the design as intended rather than using less expensive materials or cutting back on features. "Given the economic value generated by Lincoln Road, we think this is the direction we want to go," Commissioner Ricky Arriola said of the plan. Commissioners vowed to come up with the additional funding in the next budget cycle. Construction is not expected to start until the next fiscal year so there is time within the budget process to fund the project completely. "Lincoln Road deserves to be a prime, prime location in Miami Beach," echoed Commissioner Joy Malakoff. "It is one of the most popular areas in Miami Beach that people come to shop and enjoy."